Many Birther rumors are the product of creative misinterpretation. A Birther sees a false statement in an article that also includes quotes from Obama's sister, and so the Birther concludes that Obama's sister must have been the source of the author's erroneous statement. But some rumors are just cut from whole cloth, and have absolutely no basis in reality whatsoever. They are nothing more than the fantastical creations of one person's imagination, but the Birther, always gullible for anything that supports his worldview, will blindly accept it as fact without making even a cursory effort to investigate the claim being made. Then they turn around and repeat it as fact for other gullible eyes and ears to absorb. "Obama's sister Maya was born in Jakarta, Indonesia, but Anna Dunham registered her as "born in Honolulu" shortly after her birth. Maya has a State of Hawaii Certification of Live Birth, just like Obama"
This is false. Not 'misinterpretation of a real fact' false, but 'complete and utter fiction' false. 'Hitler Diaries' false. 'The planes that flew into the WTC were holograms' false. So where, then, did this claim come from? Not from a credible source, but rather from one of Birtherdom's most infamously non-credible sources: TechDude. TechDude first appeared in the comments section of Pam Geller's 'Atlas Shrugs' blog on July 4, 2008. His last appearance, before disappearing forever, was a month later, at the start of August. TechDude's sudden disappearance was concurrent with the revelation that all of his claimed personal details, including his entire expert resume, were stolen from a Missouri forensic analyst. TexasDarlin conceded that she had been fooled and she pulled down all of TechDude's submissions to her site, and even Israel Insider, which had repeatedly plugged TechDude over the past month, retracted their support of him and his work. Just five weeks after he showed up out of nowhere, TechDude was again gone. One more real fast comment before I get back to some other things here at the lab. The reason I am giving the guilty parties a few days is to see 1) if they even know their COLB was used 2) if they do know their COLB was used they can come clean and 3) to give others a chance to find the names on the COLB and post them before I do. A 3rd party finding the same information - particularly one who does not know me from Adam (teehee) - would be the final nail in the COLB’s coffin. I am not some sort of genius and there are many others who can do a much better job at this analysis but every time I try and let others step in they just sit on the sidelines and pick their noses. But they better hurry since I will be posting the full info (screen shots, methods, etc) very soon. Now is the time for all good geeks to come to the aid of their country and also win a trip to Vegas. "For a quick preview – the original COLB used to create the KOS COLB image belongs to a female and does not belong to Obama. Another follow up report will reveal exactly who the original underlying COLB did belong to. Trust me when I tell you it is going to be one hell of a major twist that no one would have seen coming." Holy crap. I’ve just duplicated the effort. It’s Maya’s - Maya Kassandra Soetoro. Her name fits perfectly in the artifacts. Later that August 5, TexasDarlin devoted an entire post to TechDude's claim that Maya's name was hidden on Obama's birth certificate. It stated that TechDude planned to release a full report detailing this discovery, but that report never materialized, because TechDude disappeared less than a week later. Birthers took this unevidenced 'discovery' of Maya's name on Obama's Hawaiian birth certificate to mean that Maya had a Hawaiian birth certificate. How else could her name appear? Obama certainly wouldn't have forged a birth certificate from another forged birth certificate. So, by Birther logic, Maya had a COLB. And since Maya was actually born in Indonesia, her possession of a COLB was evidence that Hawaii gave out COLBs to people born outside Hawaii. It's a very circular, self-serving logic which, conveniently, relies on absolutely no actual facts whatsoever. And so, despite the lack of any supporting evidence, the Birther lie that Maya Soetoro has a Hawaiian Certification of Live Birth was created, and its zombie-like corpse continues to haunt the internet, refusing to die. It shuffles on thanks to the stubborn fact-blindness of gullible fools like the one quoted above, who just prefer repeating rumor to taking a moment to ask themselves "Is this outrageous fact I'm repeating actually true?" * Credibility is important. Anyone can just say it exists. I can say I have an original Monet hanging on my wall. I asked the Birther who made the original claim above what his source was for the claim that Maya has a COLB. He cited an online post by some random Birther in Florida, who in turn cited no source at all. ** I link here to two different sites, one pro-Birther and one anti-Birther, because the page they both quote at Leo Donofrio's blog was deleted by Leo. When Birthers attempt to change the subject during a debate they're losing, they usually resort to utilizing one of a number of standard Birther talking points. One such talking point, which has the added charm of being its own mini-conspiracy theory that attempts to implicate Obama in nothing less than premeditated murder, is the name-dropping of "Lt. Quarles Harris." Have you not heard of Obama’s passport files break-in back in 2008? Then later a man who supposedly knew about this event or had information preparing to testify was found shot to death in his car??? Lt. Quarles I believe his name was. First of all, as anyone who's made even the most cursory attempt to check their facts knows, the individual in question was not "Lt." He was not an officer at all, military or police. This error was first made by the Washington Times (thus illustrating how attentively the Times checks its facts), and has been regularly repeated since then, including in two WorldNetDaily articles. No, his name was "Leiutenant Quarles Harris Jr." He's listed, with that nontraditional spelling of his first name, in the Social Security Death Index, where it also gives his birthdate in 1983 and his date of death, which was April 18, 2008. Officers responding to a report of gunfire in the 2800 block of 12th Street, NE, found the body of 24-year-old Leiutenant Quarles Harris, Jr in a vehicle. Police say he had been shot several times. Police stopped [Harris] and found 20 credit cards and eight completed passport applications. According to court documents, Leiutenant Harris told police he and someone inside the State Department were taking information off passport applications, which they used to get fraudulent credit cards. Another conspirator, inside the Postal Service, intercepted the cards before they could get to the actual people. Police are investigating the murder, while State Department Diplomatic Security, Secret Service and the Postal Inspector are all investigating the fraud case. The only comment from law enforcement was that it's an ongoing investigation. Leiutant Harris' murder comes after a spat of violence in the fifth ward. There were five homicides in a four day period. You can read the actual criminal complaint filed against Harris here, wherein he was charged with credit card fraud. You may notice something absent from both these articles and the complaint: any mention of the passport breach of the records of Clinton, McCain and Obama that broke in March 2008. It's absent for the simple reason that it's not related. At all. In the case of Mr. Harris, he was charged with a credit card fraud scheme that he said involved a State Department employee who fed him passport information that Harris used to apply for credit cards, and a Postal Service employee who intercepted the cards before they were delivered. As I noted above, when he was arrested, Harris was found with 19 different credit cards (plus two duplicates) and 8 passport applications, none of which were in his name. None of the documents were said to be in the names of any Presidential candidates (who would be rather poorly chosen marks in an identity theft scheme). Mr. Harris was fatally shot in Northeast Washington in April. Police at the time said they had no information linking his shooting to his involvement in the passport case. The breach came to light in March around the same time The Times first reported that three State Department contract employees were being investigated for improperly accessing the passport data of presidential candidates Sens. Barack Obama, John McCain and Hillary Rodham Clinton. [State Department spokesman Sean] McCormack said the cases are not related. Harris had indeed provided help to federal investigators, but it was with regard to his crimes, not the breach of the candidates' passport files. As noted in his criminal complaint, right after his arrest, at the police station, Harris was questioned by agents of the U.S. Secret Service, U.S. Department of State, and U.S. Postal Service. ** As best I can tell, the only assistance provided to federal investigators by Harris was through this post-arrest interrogation. Where, then, did the notion that the two cases were related originate? It was probably inevitable that conspiracy theorists would try to connect the two, but they were dealt an assist by the Washington Times article about Harris' death. In that article, the Times mentioned the paper's previous coverage of the Presidential passport breach, but drew no direct connection between the two. Readers, however, appear to have interpreted the mention of the passport breach as evidence of a connection between the two cases. Conspiracists have been further emboldened by even more inaccurate reporting on the subject, such as that by Bob Unruh at WorldNetDaily. Unruh simply out-and-out falsely reports that Harris was a "key witness" in the breach investigation, based on Unruh's own misreading of the Washington Times article, which he cites as his only source for the connection. So there you have it. Leiutenant Quarles Harris Jr. was a credit card fraudster and an identity thief, but he had no connections whatsoever with the breaching of the Presidential candidates' passport files, and the only assistance he provided to federal investigators was on his criminal case, not the breach-related misconduct. * Analysis Corp.'s President and CEO is John O. Brennan, an advisor to Obama during his campaign and administration. Birthers have yet another conspiracy theory about his supposed involvement in the passport breach, but that it wholly unrelated to Mr. Harris, and thus irrelevant to this post. ** To preempt the obvious and inevitable conspiracist response, among the roles of the U.S. Secret Service is to investigate credit card fraud. We're not talking about citizen at birth, but rather Natural Born Citizen, which remains what it was in the late 1780s when the Constitution was written and ratified. No meer [sic] law, which is what the US code is, can modify the meaning of a Constitution term. Another relevant quote from El Gato is "Congress has no other power to confer citizenship, except via naturalization." These two beliefs taken together, however, create a rather unfortunate, and perhaps telling, consequence. This same language, "any alien, being a free white person," was repeated and reiterated in the Naturalization Act of 1795. Thus, during the decade following the passage of the Constitution, the time specified by "El Gato" as strictly defining the meaning of "natural born citizen," only immigrants with white skin could become naturalized U.S. citizens. Asian immigrants could not be naturalized citizens. African immigrants could not be naturalized citizens. Arab immigrants could not be naturalized citizens. Naturalization was an institution strictly limited to whites, and only whites. It follows then that if non-white immigrants could not become naturalized citizens, then their native born children could never be born to two citizen parents. Such would be a legal impossibility. Thus, according to "El Gato," if "Natural Born Citizen...remains what it was in the late 1780s when the Constitution was written and ratified," and if he believes that the Founders intended natural-born citizenship to require two citizen parents, then he is categorically proposing that no child of a non-white immigrant is eligible to be President. Children of white immigrants? Sure. That's fine. But children of non-white immigrants need not apply. According to El Gato, that is. So Polarik gave an unduly long "interview" to the Birther press the other day. And in addition to referring to yours truly as "the most clueless, irresponsible, deceitful, egotistical, and flat-out fraudulent person in the history of the Internet," Ron also introduced a brand-new conspiracy theory of his to a wider audience. First of all, one of my two biggest discoveries that I made in the two years that I have been researching this birth certificate controversy has nothing to do with the birth certificate. It was discovering that Politifact had started the false rumor that Obama's middle name is Muhammed, and used it to endlessly "debunk" it in conjuction with facts about Obama. This is a rather specific allegation, and since it's called a "discovery," that implies there's some kind of evidence to support it. (As opposed to it being just random speculation.) But no supporting evidence is identified; just the conclusion. In fact, and contrary to the claim as made, the "Obama's middle name is Muhammed' rumor did not originate with Politifact. As far as I can tell, it started with this e-mail forward in December 2007. It started hitting a lot of websites in early January 2008 (for instance, it was posted at FreeRepublic on January 4), and got relatively major exposure via Bill Cunningham on January 6. Politifact did indeed move to debunk the rumor quickly, but their article about it came on January 11, 2008, five days after Cunningham's usage on the radio, and nearly three weeks after the e-mail forward that was submitted to About.com. So unless the allegation is that Politifact created the email forward in mid-December 2007, filling it with talk about Trinity Church, and using it to introduce a fake rumor that it would then shoot down a month later, this conspiracy theory simply has no legs to stand on. And if the allegation IS that Politifact secretly created an email rumor about a Presidential candidate just to debunk it a month later, well, it's hard to imagine what secret evidence could have possibly been "discovered" to validate such a hypothesis. Lucas Smith is, among other things, a novelist. Supposedly. On his YouTube profile, Smith says he "Penned my first book in the year 2002 and went on to publish it the year 2005. Murder By Tejuana & Treachery By Bush And The Supreme Court: A document in the form of a novel, Volume 1 of 4." A couple of years ago, he created a Wikipedia page about this book. It was eventually deleted, but Deletionpedia saved it. The manuscript of this book was originally banned from publication by a US District Court whose ruling was affirmed by a US Circuit Court of Appeals. Due to a US Supreme Court ruling, this book was allowed to be published provided it would be "...published as a work of fiction..."
There is no Supreme Court case with that quote. I checked. The Supreme Court and Court of Appeals cases he mentions here simply don't exist. Given that he provides no citations or details as to any of these three cases, there's no reason to believe that any of them ever actually existed. Similarly, in August 2007, Smith added citations to two supposed Australian newspaper articles about his book. As far as I can tell, neither of those articles are real either. So to anyone inclined to believe that Smith really possesses secret evidence that supports his claims, remember that he's manufactured and promoted other fake stories in the recent past. You may recall that in Berg v. Obama, two affidavits were filed relating to the infamous telephone conversation with Sarah Obama. One affidavit was from Ron McRae, and the other was from the pseudonymous "Kweli Shuhubia". It should be noted upfront that there are several glaring deficiencies in the latter affidavit. First, "Kweli Shuhubia" is a pseudonym, and not a real name. Second, nowhere in the affidavit does it mention that the name is fake. Third, the document is not notarized. Fourth, the document is not actually signed at all; the 'signature' is actually just a jpeg of an unintelligible signature cut-and-pasted onto the document. Fifth, unlike McRae's affidavit, Shuhubia's is not hand-dated; the alleged date of signature is pre-printed on the form. But there is another facet of the Shuhubia document that I believe has long been overlooked: most of it is copied, wholesale, from McRae's affidavit. Shuhubia's description of the conversation is almost word-for-word identical to McRae's, with only occasional minor changes and the necessary shifts between first and third person. Thus, it's abundantly clear that one affidavit was drafted from the other. And given that McRae's is dated October 27 whereas Shuhubia's is dated October 30, and that Shuhubia's is hardly signed at all, I believe one could draw a reasonable conclusion as to which was the original, and which was the second draft. Nancy Pelosi: Natural Born Citizen? When Birthers fantasize about what would happen if Obama were removed from office, they tend to ultimately put Senator Robert Byrd in the Oval Office. Joe Biden is deemed ineligible because he was elected as Obama's running-mate, and Nancy Pelosi is deemed ineligible due to some pseudo-legalistic arguments surrounding her signature on Obama's qualification form. Curiously, in the seventeen months since Obama took office, I've never yet seen a Birther ask or answer what I should think would be a top priority for them: is Nancy Pelosi a "natural born citizen"? After all, Birthers can talk a blue streak about why Obama's dual citizenship at birth or his father's citizenship makes him Constitutionally ineligible under their fabricated definitional scheme, but no one ever applies that to Speaker Pelosi. The reason that is so curious is because, like Obama, Nancy Pelosi is the daughter of an immigrant. Her mother, Annunciata M. Lombardi, was born in Italy in 1909, and immigrated to the United States as a child. Pelosi's paternal grandfather was also an Italian immigrant, and thus like Tom Tancredo, Pelosi may possess Italian citizenship. Now I've checked, and in the 1930 census, Pelosi's mother is listed as a naturalized citizen. But I had to research that myself; Pelosi's mother's origins are publicly known, but no Birther has ever expended any effort to learn when or whether Annunciata naturalized. Birthers did not subject Pelosi to their "natural born citizen" standard and, after historical research, find her satisfactory; no, instead they've never bothered to check at all. And thus, Birthers accidentally betray the truth. The reason they have never checked the citizenship of Nancy Pelosi's parents is because the citizenship of Nancy Pelosi's parents doesn't matter. Not Constitutionally, at least. And neither does the citizenship of Barack Obama's parents, or of any President's parents for the past two centuries. That's why prior to 2008, even the Birthers themselves never concerned themselves with the citizenship of the parents of Presidential candidates. Birthers have created an imaginary definition that they say disqualifies Obama, but they can't manage to employ it consistently even now. We all missed the occasion, but yesterday was the two-year anniversary of the ostensible birth of Birtherism. Although the 'born in Kenya' rumor had found its way onto a scant handful of websites during the prior three months, it didn't garner any attention or following until after Obama clinched the party nomination, when Jim Geraghty wrote this post on June 9, 2008. Some people still claim that questions were being raised earlier in the campaign, back into 2007 or earlier. Simply put: they're wrong. Their memories deceive them. The story of Ann Dunham traveling to Kenya and secreting a baby back wasn't even created until after Super Tuesday 2008, and only the fringiest of bloggers paid it any heed until June. This Saturday, June 12, is also the two-year anniversary of the publication of the Certification of Live Birth. Only three days after the issue broke. A very prompt response, and yet the nonsense lives on. Andy Martin is not a Natural Born Citizen!? Obama is ineligible by his own admission. He claims his father was Barack Hussein Obama BHO from Kenya. Ironically, Obama’s case illustrates exactly what the founders were trying to prevent: a drive-by president. Martin also said President Obama violates the constitutional requirement the President be a natural born citizen, because his father was a Kenyan national, so both his parents were not U.S. citizens. KITV4 asked him if the child of an immigrant should not be the president of United States. "If his parents didn't meet the natural-born test when he was born, personally, I would enforce the constitution, yes,” he said. Martin, it seems, has firmly staked his ground with those who allege that to be a "natural born citizen," and to thus be eligible to be the President of the United States, one must be born to two U.S. citizen parents. 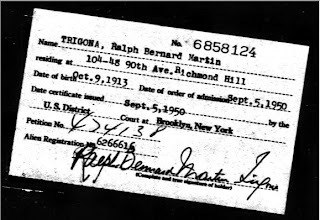 As seen here, Anthony Robert Martin-Trigona, a/k/a Andy Martin, was born in 1945 to Ralph Martin-Trigona (1913-1994) and Helen Vasilou. Thus, Andy Martin's himself was not born to two U.S. citizens, as his father did not naturalize until Andy was 5. And yet, this did not stop Martin from running for President in 1988 as a Democrat. Nor did it stop him from running for President in 2000 as a Republican. Did the definition of "natural born citizen" change since 2000? Is Andy Martin attempting to hold Obama to a different definitional standard than himself? Or was Andy Martin, the son of a foreign citizen, attempting his own usurpation of the American government? The answer is, of course, that Andy Martin is indeed a natural born citizen, because his parents' citizenship is irrelevant. And just as his father's citizenship in 1945 has no bearing on Martin's eligibility, so too does Barack Obama Sr's citizenship have no bearing on President Obama's eligibility. Mr. Martin is free to run for President, but it is hypocritical to apply a different legal standard to Obama than he applies to himself. John Charles Frémont was the Republican Party's very first nominee for President of the United States, in 1856. Born in Savannah, Georgia in 1813, he was the son of Charles Fremon and Anne Beverley Whiting. The traditional narrative holds that Frémont's father, Charles Fremon, was a French immigrant who had fought in the French Revolution. However, according to Andrew F. Rolle, author of John Charles Frémont: Character As Destiny, Frémont's father was actually born Louis-René Frémont in Quebec, Canada. Either way, Rolle reports that after some years of imprisonment overseas, the elder Frémont arrived in Virginia around 1810, and after arriving in Richmond, he began a relationship with Anne Whiting. John Charles Frémont was born to these two on January 21, 1813. Rolle refers to Charles Fremon as Anne's "foreign lover," and gives no indication whatsoever that he ever naturalized as a U.S. citizen at any time prior to his death in 1818. Moreover, the scandalous origins of Frémont's father were hardly hidden from the public. Thus, John Charles Frémont, the first Republican Presidential candidate in U.S. history and a man born a scant 26 years after the adoption of the U.S. Constitution, was himself the son of a non-U.S. citizen father. Just like Barack Obama. And just as the citizenship of Frémont's father was no Constitutional impediment to his eligibility, neither is Obama Senior's an obstacle to his son's. The question then is: will the 'Birthers' accept this as evidence that their favored definition of "natural born citizen" is wrong, or will they attempt to retroactively declare America's first Republican Presidential candidate to be an attempted foreign usurper? I'm going to take a break from Birtherism to address a widely-circulated photo of Obama smoking. Normally I don't deal with random Obama rumors, but considering that I believed this one for over a year myself, I feel it's worth sharing with others. I never scrutinized the photo, and given that Obama is known to smoke, I didn't give much thought to its authenticity. But as it turns out, it is just a Photoshopped fake. That's an original image from the Illinois News Bureau on August 5, 2004. With a little cropping, flipping, and pasting, the fake image was created. Notice that in the smoking photo, the button on Obama's shirt collar is on the wrong side. And now the Photoshopped image is plastered all over the web, with almost no one acknowledging that it's a total fake. The Museum of Hoaxes also addressed this photo some time back. And the image above is from AngryWhiteboy.com, where it was posted in February 2007, the earliest usage I've found. Someone adapted the Birther platonic dialogue I wrote last January into a short little animated video. As it happens, I've drafted an updated version of the dialogue, but this was a nice surprise. Of all the newspaper articles with mistakes that Birthers love to cite, among the most popular is a November 4, 2008 UPI article that originally said "Obama described his birth at Queen's Memorial Hospital in Hawaii Aug. 4, 1961..."
Although the article does not state that Obama identified Queen's by name in his speech, and although the article is somewhat ambiguous as to what speech it may even be referring to, and although there is no other news story claiming that Obama referenced Queen's, and although there is no video or audio of any speech wherein Obama referenced Queen's, Birthers have taken this article as gospel proof that Obama personally named Queen's Memorial Hospital as his place of birth in a speech. Naturally, when this error was brought to UPI's attention, they corrected it and added an editorial note stating that the reference to Queen's was a mistake made by the writer. This did not dissuade the Birthers, as any correction of a mistake is viewed as "scrubbing" (whereas the failure to correct a mistake is viewed as continued endorsement of its accuracy). In any case, exactly how reliable was UPI's reporting in this particular article? Did they write an article that was perfect on all factual details except for the name of the hospital? On a freezing day in February 2007, the first-term U.S. senator announced his candidacy for president outside the Old State Capitol in Springfield, Ill., saying he could not wait until politics "boil the hope out of him." The phrase "boil the hope out of him" was not used in Obama's February 10, 2007 speech announcing his candidacy. The only similar usage I've located is when Obama said "They say Obama has not been in Washington long enough. He needs to be seasoned and stewed to boil all that hope out of him," nearly a year later in January 2008. His best-selling third book was called "The Audacity of Hope: Thoughts on Reclaiming the American Dream." "The Audacity of Hope" was Obama's second book, not his third. Obama has not written a third book. Stanley Ann Dunham died at age 52, not 53. Although UPI identifies Obama's mother as "late," it fails to do so with his grandmother, who was also deceased at the time of this article. taught him how to dream and value hard work, and were the guiding forces of his life. I can't find anything resembling such statements in his February 10, 2007 speech. If UPI is referring to another speech during the two-year campaign, it offers no hints as to when or where. Obama was born at Kapi'olani Medical Center, not Queen's. Again, there does not appear to be any talk of Obama's birth in his February 10, 2007 speech. as an "all-America" story transcending orthodox racial stereotypes and experience. The quoted phrase "all-America" definitely does not appear in the February 10, 2007 speech. If it appears in another speech, I cannot determine where. That fall he won his Senate seat with more than 70 percent of the vote. Obama won slightly less than 70 percent of the vote, not more. 69.97%, to be precise. They married in 1992 and have two daughters, Malia, 9, and Sasha, 7. At the time this article was published, Malia was 10, not 9. That's a total of 4 outright errors about Obama's personal life, 2 technical errors, 1 inconsistency in tense, 2 quotes of unidentified origin, and at least 2 topics that are said to have been discussed in a speech but were not. So why is UPI's reporting in this article assumed by Birthers to be impeccable? Tom Tancredo: Foreign Citizen? Attempted Usurper? Tom Tancredo, former Congressman from Colorado, was among the Republicans vying for the party's 2008 Presidential nomination. Tancredo made a name for himself on the issue of immigration, not only calling for strong measures to halt illegal immigration, but also proposing such measures as a three-year moratorium on legal immigration and the complete elimination of H-1B visas for temporary workers. In February 2010, Tancredo shared the stage at the National Tea Party Convention with Sarah Palin and Birther advocate Joseph Farah. Farah, as it happens, also endorsed Tancredo during the 2008 campaign. Such an endorsement would rather suggest that Tancredo's eligibility was not in question. But under the Birther standard of Presidential eligibility, that is far from certain. Tancredo's website states that he was born in Denver, Colorado, but there is no publicly-available evidence supporting this. No birth certificate, no newspaper announcements, nothing. What was the name of the hospital Tom Tancredo was born in? What was the name of the doctor who delivered him? We don't know. And yet, this lack of information did not stand in the way of Tancredo garnering the endorsement of the man who demands this same information from Obama. Moreover, Tancredo's website states that he is the "grandson of Italian immigrants." Whereas Barack Obama has American ancestors dating back to the eighteenth century, Tom Tancredo is only two generations (at most) removed from Europe. Indeed, his grandparents' nationality is reflected in Tancredo's genealogy, as provided by William Reitweisner. But even Reitweisner doesn't identify a birthplace for Tom's father, Gerald Tancredo. 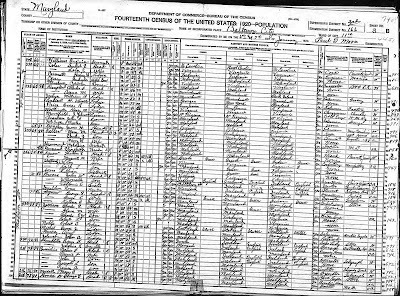 And despite a birthdate in 1911, there is no "Gerald Tancredo" in the 1920 or 1930 Censuses. In other words: we have no evidence that Gerald Tancredo was born in the United States, or that he was a U.S. citizen when Tom was born in 1945. Still, that remains speculative. Perhaps Tom could prove he was born in Denver, satisfying that prong of Birtherism. Perhaps he could prove that his father was a U.S. citizen, satisfying that prong. But there is one prog of Birtherism that he very likely does not satisfy. Tom's paternal grandfather was an Italian native and citizen. As was, one should imagine, his paternal great-grandfather. Under Italian citizenship law, that makes Tom Tancredo a citizen of Italy. And if persons entitled to dual citizenships are excluded from the Presidency, as many Birthers insist, then Tom Tancredo was running for an office he was Constitutionally ineligible for. Of course, no one ever questioned Tancredo's eligibility, or inquired into his parents' citizenship, or investigated the nuances of Italian citizenship law as it pertained to his father and grandfather. Indeed, he was personally endorsed by no less than Birtherism's greatest spokesman. Perhaps if Tancredo runs again in 2012, we'll see how consistent the Birthers are. As an aid to my fellow Americans who might find themselves confronted with a Birther and his arguments, I thought to prepare a top ten list of rhetorical devices that Birthers tend to use when confronted with counter-arguments and evidence that contradicts their existing beliefs. Learning to recognize these methods and logical fallacies is the first step in promoting useful dialogue and avoiding unnecessary conflict. And as might be appropriate for April Fools Day, it should serve as a handy list of the most common ways that Birthers try to fool others everyday. However, as I attempted to assemble a list, I was amused to find that I could not think of ten different Birther devices. Rather, the typical Birther responses to critical analysis of their position can be broken down into as few as five categories. Note, this is a breakdown of Birther responses to questions or criticism, not initial Birther arguments. Those can be summed up largely as Argument from Ignorance (something is true because we don't know it isn't true) and Misrepresenting Evidence (take your pick). These items below are the ways that Birthers respond to challenges to their statements, positions, or worldview. Here, the Birther responds to substantive criticism not by defending his position, but by levying a personal attack upon the questioner, or upon a third party (such as Obama, or FactCheck, or a judge). The subject itself is evaded entirely, and the Birther substitutes an on-topic response with mocking of the questioner, smearing of a third party, or making negative insinuations about whoever might disagree with them. EXAMPLE: Marvin stated that "the Senate held hearings regarding McCain’s natural born citizenship." I responded to Marvin showing that no such hearings ever took place, and that the only testimony was a single question during a Judiciary Committee briefing. Marvin's entire response was "Your hatred of those questioning your pres_ _ent is coloring your mind. Maybe the kneepads are too tight?" As you see, rather than defend his previous statement, Marvin completely ignored my factual evidence and chose to redirect the subject of the conversation to be about me, making accusations about my emotional state, my mental acuity, and my partisan stance. Special pleading is a logical fallacy where one deflects criticism by concocting an external rationale as to why the usual rules of evidence should not apply to the argument they're making. With Birthers, this most often takes the form of suggesting or implying the existence of a covert conspiracy that has interfered with the available evidence. When confronted with evidence that contradicts Birther beliefs, the Birther alleges that the conspiracy created that evidence to fool the public. When confronted with the lack of evidence supporting Birther beliefs, the Birther alleges that the conspiracy has destroyed or hidden all the secret evidence that would support his beliefs. EXAMPLE: Birth announcements of Obama's birth were found in two Hawaii newspapers. Solid evidence, no? But Ron responded to this evidence by proposing an elaborate scheme whereby the library's microfiche was altered or forged. The end result is that the birth announcements are discounted because Ron thinks the conspirators created them. Sometimes new evidence presents itself that meets a Birther's previously-stated evidentiary demand. When confronted with this new evidence, such as newspaper birth announcements or official health official statements, the Birther response is to claim that that new evidence, despite being what they had previously demanded, is now insufficient to satisfy them. So it's no longer enough that the Director of the Hawaii Department of Health issued a statement, they want the Hawaiian Governor to issue a statement too. This turns any attempt to satisfy the Birther's curiosity into a neverending marathon, as the Birther's standard of proof continues to grow higher and higher. EXAMPLE: "Steven" complained that when Obama took the Oath of Office a second time, the "redo was held a few days later, no witness, no media, behind closed doors." I pointed out that not only was this incorrect in several respects, but CBS Radio released an audio recording of the second oath. "Steven" responded not by conceding his mistake, but only by demanding video footage in addition to the available audio and photographic record. Given the frequency with which Birthers fall back on unsourced claims, a ready response is often to simply ask the Birther to produce a source for his factual claim. On the occasions that the Birther is willing to actually stay on topic (as opposed to the responses exemplified by Tactics 1, 4, or 5), the most common reaction is to refuse to provide any evidence for the factual claim they just made, and to instead tell the skeptic to go look for it himself. This not only allows the Birther to create work for the skeptic but not himself, but it also allows the Birther to claim that any failure to find evidence supporting his factual assertion is the fault of the skeptic questioning the alleged fact, rather than the fault of the Birther who made the questionable assertion. EXAMPLE: Leonard wrote of Obama that there are "a few witnesses claiming he was born in Kenya." I asked him who. He cited a supposed encounter between Jerome Corsi and a Kenyan health official. Having never heard of such an encounter, I asked Leonard where Corsi reported this event. Leonard's response was "Do your own searches." He never produced any evidence to support his initial claim of witnesses or his specific claim of a Corsi conversation. Instead, he acted like it was my job to find evidence of his claims. My personal favorite of all Birther debating tactics, because they utilize it so incredibly often. If a Birther finds himself pinned down on a position or statement that he simply cannot defend, he will frequently avoid conceding by attempting to shift the topic of discussion to another Birther topic. And often, it will be a topic that is less factually-specific and more speculative or interpretative, and thus less susceptible to absolute proof of falsehood. Point out that there never was a Pakistani travel ban, and the Birther starts talking about adoption. Illustrate that it was TechDude who made up the claim about Maya's COLB, and suddenly the Birther wants to talk about Vattel. By shifting the focus onto an unrelated issue, the Birther attempts to take the attention off the demonstratably false factual situation, hoping that the new issue will be a distraction. EXAMPLE: Steve was confronted with the allegation that he is not the credentialed expert that he has posed as and as other Birthers have treated him. Does Steve have forensic experience or not? Steve could have answered the question, or at least address it, but he didn't. Instead, he penned a lengthy response where he completely ignored the questions about his document experience, and opts to talk about about everything from Perkins Coie to citizen grand juries to criminal conspiracies to Obama's poll numbers to Bill Richardson quotes to the issue of legal standing. Having been caught in a statement he cannnot defend, Steve started throwing out multiple other topics in the hopes of diverting attention away from his original, unsupportable position. So if you find yourself tangling with a Birther, and you get one of the above responses, consider replying with a simple number citation and a link to this post. Whatever you do, don't allow yourself to get distracted by tricks like these. Fair warning, though: don't be surprised if failing to fall for tricks #1-4 results in #5 being levied at you soon thereafter. DOMINICK: You think he’s an American citizen and a Christian? BROUN: I’m not gonna get involved in that. DOMINICK: You can’t say that he’s an American citizen? DOMINICK: You can’t say the president’s an American citizen? "That's what I said when I was asked: I don't know, nobody knows for sure, we've not seen any documentation one way or the other." Like Nathan Deal, Broun has resorted to weasel code. "We've not seen any documentation?" Horse-apples. We've seen his birth certificate. We've seen his newspaper birth announcements. We've seen the director of Hawaii's vital records department formally declare that he was born in Hawaii. Thus, Broun's claim that "we've not seen any documentation" can mean only one of two things. One possibility is that he is ignorant of all of this evidence. I find this doubtful, considering that in the same interview, Broun acknowledges his familiarity with the questions that others have been asking. In any case, he's only promoting an image of ignorance if he's claiming to be unaware of the birth certificate that has been available online for almost two years. The other possibility is that Broun is aware of the existence of this evidence, but for some reason, does not consider it to be decisive "one way or the other." Is Broun expressing doubt as to the authenticity or reliability of the available evidence? Does he subscribe to the conspiracist view that Obama's family and/or the state of Hawaii have been engaged in a conspiracy to cover up a non-Hawaiian birth? Is he suggesting that the evidence should be doubted in the face of baseless online rumor? What does Broun mean by this obvious falsehood? Birther Mythbusting: Barack Obama was not born "White"
Conspiracism does not hold up consistency as a virtue. Every Birther is very familiar with the infamous Nordyke twins' birth certificates, issued in 1961 for girls born at Kapiolani Hospital within hours of Obama himself. Birthers are also quite fond of arguing that Obama's hospital birth certificate might identify the newborn Obama's race as "white." To wit, "I read that Obama will not release his birth certificate. Have heard rumors it's because he is listed as white." This is a patently foolish theory for at least two reasons. First, we've seen baby photos of Barack Obama, and it's hard to imagine anyone in 1961 looking at such a baby and declaring him "white." There are only two boxes for "Race" on the entire certificate, both of which I've marked above. One for the father's race, the other is for the mother's race. Both of these categories are repeated on the COLB. There is no box for the race of the newborn child. Again, let me repeat that: a 1961 long-form Hawaiian birth certificate does not have any box for "Race of Child." 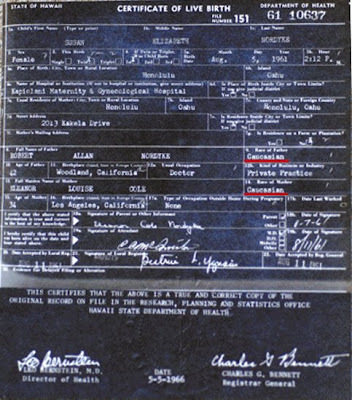 Obama's long-form birth certificate does not say he was born "white" because it CAN'T say his race. There's no spot for it. It's a simple and outright impossibility. Simply looking at the Nordyke certificate should instantly tell you that the theory has no factual grounds to even start building on. You might as well speculate that his birth certificate claims that he was born "Communist" or "Handsome." This should hardly be a surprise either, since modern American birth certificates almost never have a box for the race of the newborn. That's a judgment call that hospital staff have no business making. So why does this canard continue to be repeated, seven months after the Nordyke certificates should have put this to rest forever? Because Birthers don't pay attention to evidence, and don't allow contrary evidence to affect their postitions. "In a November 2004 interview with the Rainbow Newsletter, Maya told reporters her half-brother Sen. Barack Obama was born on Aug. 4, 1961, at Queens Medical Center in Honolulu." Furthermore, the Rainbow Edition News Letter, November 2004 Edition, published by the Education Laboratory School, attached as EXHIBIT “1”, did a several page article of an interview with Obama and his half-sister, Maya. The Rainbow Edition News Letter reports Obama was born August 4, 1961 at Queens Medical Center in Honolulu, Hawaii. Note that Berg does not explicitly state that Maya was quoted as saying Queens, though he would appear to want the reader to draw that conclusion. Also, Berg erroneously claims that the article included an interview with Obama, and to be nitpicky, even the most generous definition of "several" does not encompass the actual two-page length of the article. Berg, however, does get right what Corsi and many others have subsequently gotten wrong: the Rainbow Edition Newsletter is nothing more than a high school newspaper. The article in question was written not by a reporter, and not by a colleague of Maya Soetoro, but by a high school junior. Additionally, what is immediately obvious upon actually viewing the article is that the "Queens Medical Center" reference is not a quote from Maya at all. It's simply referenced in the introductory paragraph. In fact, it's such a mundane fact that it's hard to imagine even an amateur journalist wasting time asking for it during an interview. Still, the fact that the reference is not credited to Maya, and the fact that the article is full of mundane facts that it would be foolhardy to attribute to Maya, this has not stopped some Birthers, like BP2 (or as I'll call him, Beeps), from insisting that the source must have been Maya Soetoro. Barack Obama was born on August 4, 1961 at the Queen’s Medical Center in Honolulu, Hawaii. Obama lived here with his parents Barack Obama, Sr. and Ann Dunham until they divorced when he was two. Obama moved back to Hawaii when he was ten and lived with his grandmother Madelyn Dunham and half-sister of our very own, Maya Soetoro. Barack Obama was born at the Queen's Medical Center in Honolulu, Hawaii. His parents were economist Barack Obama, Sr., of Kenya and S. Ann Dunham,...When Obama was two years old, the couple divorced...When Obama was ten, he returned to Hawaii under the care of his grandmother Madelyn Dunham. In addition to the textual similarity, notice what's missing from the Rainbow Edition account above. It describes when Obama "moved back to Hawaii," but gives no prior indication that he'd ever left. That's because the Rainbow Edition omitted the Wikipedia information (between the ellipses above) about his childhood move to Jakarta. His Republican opponent, Jack Ryan was forced to dropout of the race after Republican leaders questioned his integrity. Mike Ditka, former NFL Coach, was going to be the new Republican candidate but he decided not to join because of family and business reasons. Alan Keyes, from Maryland, was nominated by Illinois Republican Chairwoman, Judy Baar Topinka. It looked like Obama was guaranteed a win because of his growing popularity around the state of Chicago. In the end, Obama won almost seventy percent of the vote. Former Chicago Bears coach Mike Ditka had considered running as a Republican to replace Ryan, but opted not to because of family and business considerations. On August 3, Illinois Republican Chairwoman Judy Baar Topinka announced two possible replacements: Alan Keyes and former presidential advisor Andrea Barthwell. After much deliberation, Keyes, at the time living in Maryland, was nominated...Obama received nearly 70% of the popular vote. Obama first became involved with politics when he was voted onto the Illinois State Senate in 1996. During his time, he helped to provide the poor with benefits andpassed bills for increased funding for AIDS programs. In 2000, he ran in the Democratic primary for Illiois’ 1st Congressinoal district but he lost to the incumbent Repersentative Bobby Rush. In 1996, Obama was elected to the Illinois State Senate...during his tenure in the legislature, he helped to author a state earned income tax credit providing benefits to the poor...he successfully passed bills to increase funding for AIDS prevention and care programs. In 2000, he ran in the Democratic primary for Illinois' 1st Congressional district against incumbent Representative Bobby Rush, but was badly defeated. This past year, he became the third African-American to give the keynote address at the Democratic National Convention. After winning his race, Obama became only the fifth African-American Senator in our nation’s history. Right now, Obama is also a law professor at the University of Chicago. A University of Chicago law professor, Obama in November, 2004, won an open seat in the U.S. Senate against Republican candidate Alan Keyes, becoming the only serving black U.S. senator in 2004 and just the fifth in the country's history...Obama was chosen to deliver a keynote address at the 2004 Democratic National Convention in Boston, Massachusetts, and became the third African American to do so. Berg and Beeps have argued that the high school student also interviewed Obama himself, and "Queen's" came from him. But in addition to the above, there is no evidence in the article that Obama was interviewed at all. One of the two Obama quotes included in the Rainbow Edition ("The irony is that my decision to work in politics...") is taken straight from the Wikipedia page. The only other Obama quote came from this January 2004 video interview. In our discussion some months back, Beeps initially argued that the high school kid must have personally interviewed Obama to obtain this quote, and then when I confronted him with this video transcript, he resorted to allegations of historical revisionism, and then abruptly changed the subject. Typical Birther behavior, in other words. Beeps also argued that "They properly checked the spelling, grammar, punctuation, style – ONLY to get that birth place wrong." Which is, again, grossly inaccurate. There are, in fact, multiple spelling, grammatical, punctuation, and style errors throughout the Rainbow Edition article. In the category of spelling errors alone, the author wrote "Illiois," "Congressinoal," "Repersentative," "whoe," "chilhood," "competetive" and "accoplishments." And who, you may ask, was Wikipedia's ultimate source for "Queen's Medical Center," since no source citation was given in the Wiki entry? It was simply a Hawaiian college kid who liked editing Wikipedia, and took a guess as to which hospital Obama was born in. He explained his reasoning to me, saying it "was based on presumption without original source. Conjecture based on Queen's being the largest hospital in Hawaii, near the University of Hawaii at Manoa where the Obamas went to school, presumed that they were still in school and probably lived near campus. Queen's is in a central location and a place of power, a block away from the Hawaii State Capitol, Iolani Palace and the governor's residence at Washington Place. As it turns out, the Obamas lived in an apartment just across the street from the Kapiolani Medical Center for Women and Children, a location even closer to the university campus." 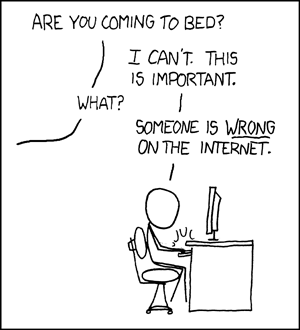 And he concluded, "Put in simple terms: I was the source and the source was wrong." So there you have it. Maya Soetoro never told the Rainbow Edition or any other publication that her brother was born at Queen's Medical Center.